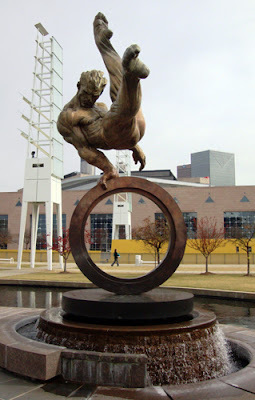 Donated to the City of Atlanta for the 1996 Olympic Summer Games—the centennial celebration of the modern Olympic Games—"The Flair," a 26-foot bronze statue of a gymnast, stands in Georgia International Plaza as a "testament to the dedication and determination of all individuals in the pursuit of excellence." Native Californian and recipient of national and international awards, artist Richard MacDonald also designed the granite plaza (within Georgia International Plaza) where "The Flair" still stands today, 14 years later. Georgia International Plaza is located immediately in front of Georgia Dome to the east.